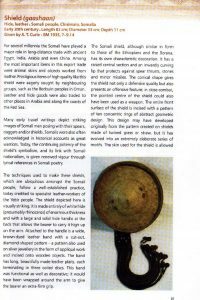 Read the rest of the article here (Open ACCESS): Mire S. (2006), Gaashaan: Somali shield. In: Hudson, J. and K. Lagat (Eds.) Hazina: Tradition, Trade and Transition in Eastern Africa. Nairobi: National Museums of Kenya. 29-30. Related publications (OPEN ACCESS): Mire S. (2015), Wagar, Fertility and Phallic Stelae: Cushitic Sky-God Belief and the Site of Saint Aw-Barkhadle in Somaliland, African Archaeological Review 32(1): 93-109.